Credit: Public Services International. All rights reserved. The World Economic Forum (WEF), currently taking place in Davos, is the premiere sales-pitch for private-sector solutions. CEO’s will spend the week rubbing shoulders with politicians and promoting their vision of the world, all tucked away in the secrecy of the Swiss Alps. Yet many of the corporations involved in the WEF have consistently used Investor State Dispute Settlement (ISDS) - a set of rules within trade and investment treaties - to sue our governments, undermine progressive policy, win huge payouts from the public purse and prevent the urgent policy changes we need to address the world’s problems. Alarmingly the European Union is using this year’s Davos meeting to sell its ideas for making this even easier. An analysis by Public Services International reveals that over forty WEF Industry Partners have used ISDS provisions to sue states for policies or decisions they don’t like. Among the most egregious examples include ISDS cases brought against environmental protections, public health measures and attempts to make electricity more affordable. In 2005 for example, WEF-regular Cargill sued Mexico for implementing a tax on high-fructose corn syrup to address the country’s obesity crisis. In 2008, Dow Chemical sued Canada after the province of Quebec banned a harmful pesticide. And pharma-giant Novartis recently threatened to use ISDS to successfully discourage the Colombian government from making a life-saving leukaemia drug more accessible. Of course, multinationals haven’t been able to implement ISDS on their own. Our public leaders have drunk the corporate cool-aid - often convinced by false claims that ISDS is the best way to secure Foreign Direct Investment. It is in this context that the European Union has been cashing in on its “Social Europe” image to promote a new model of ISDS it calls the Multilateral Investment Court (MIC). When, thanks to great work by campaigners, a recent EU Commission consultation resulted in 97% of respondents rejecting ISDS, the EU Trade Commissioner Cecilia Maelstrom was forced to admit that “ISDS is now the most toxic acronym in Europe.” Nevertheless, at a time when even the United States is backing away from these flawed provisions, the EU Commission is continuing to rebrand and promote them. They’ve updated the acronym and made superficial changes without addressing the underlying issues; they’ve even attempted to promote the positives of ISDS for small businesses. Yet over 90% of ISDS awards go to companies with at least US$ 1 billion in annual revenue or to individuals with over US$100 million in net wealth. ISDS isn’t made for shop-owners or workers. It’s made for the Davos Class. If the EU is serious about stopping the rising tide of right wing populism that views the European Union as part of a globalised elite, it must stop its dishonest campaign to establish a permanent ISDS court against the wishes of the 97%. That’s why the “Stop ISDS coalition,” an alliance of over a hundred organisations, has chosen the WEF to launch a new campaign that calls on European leaders to end their dogmatic promotion of ISDS and instead support a binding United Nations Treaty on Transnational Corporations so that we can hold big business to account. 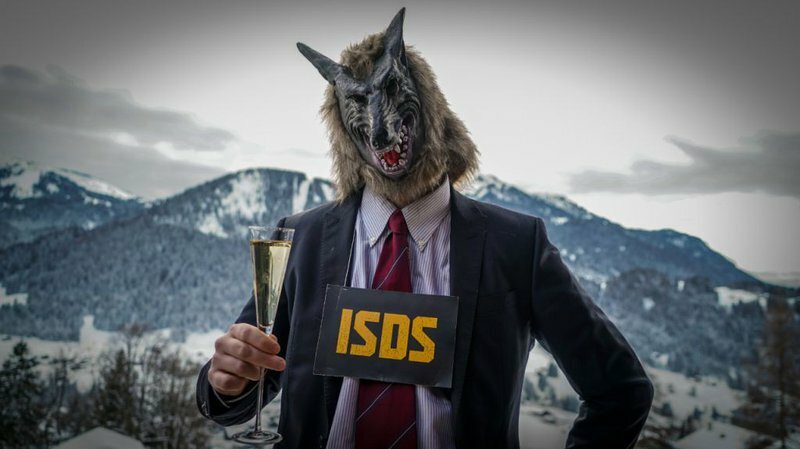 Today campaigners, dressed as Corporate ISDS Wolves invaded the streets of Davos to highlight the real face of corporate power. Nothing epitomizes the coziness between politicians and corporations quite like the WEF. And nothing epitomizes the troubling results of unchecked corporate political power quite like ISDS. It’s time it was ended.